Although hard to believe sometimes, it's true... The purpose of life, and by extension, your relationships is to access a deep and profound joy that is constantly available to tap whenever you want, whatever the circumstances, no matter what you are feeling. It is your judgements, your shame and your unworthiness, that create the disconnect from this joy and keep you feeling isolated, defensive and disconnected. One of the primary purposes of Heart IQ, is to help you notice and let go of these judgements, dissolve your shame and awaken your joy - using a group of heart-connected people to act as powerful mirrors to help you on this journey. Although this may sound strange at first, in Heart IQ, we don't see joy in the same way as other emotions like happiness, anger or sadness. Joy, from our perspective, is the result of relaxing into the goodness of who you really are when all shame, judgements and unworthiness fall away. Eventually, joy can be felt in all moments, including the times when you feel sad, angry, lost and afraid. It is therefore possible to feel good feeling bad when you realize that all feelings, all emotions, intrinsically feel good when we accept and allow them without resistance or judgement. When you learn to access this space of unconditional love and acceptance of yourself, you'll feel joyful - whatever the emotional weather in your life! Joy simply emerges when you deeply and completely love who you are, as you are, right now. Heart IQ offers you a chance to learn this skill so you can access more joy in your life, by getting into contact with yourself by becoming aware of all the parts within you that you have denied and made wrong. When you do this work together with others in a group, the amplified field becomes a powerful tool to heal your heart and past pains while providing a much needed safe container to explore new and exciting emotional-energetic ranges to take you into a hopeful and delightful future. Through trauma and neglect, you have separated yourself from your own intrinsic goodness and needs and have built an identity on not being good enough and worthy enough of love, praise and attention. You avoid feeling these feelings of unworthiness through a clever defense mechanism that in Heart IQ, we call ’S.T.U.A.R.T’. S.T.U.A.R.T has many ways of expressing itself, such as through addictions and self-diminishing behaviors - but the outcome is always the same: feeling numb, disconnected from yourself and others, while being hijacked by a strong inner critic that judges everything you think, say and do. Healing is about acceptance. You know when you are in acceptance because you will feel joy! Because it's your default state to feel joyful (yes, really! ), when you're not feeling joy in any given moment, you're actually in a state of resistance. This is normally felt as emotional, energetic, physical or mental tension or stress or in some cases, as a background numbing 'static' that has been present for so long, you've forgotten it's even there! Thus, years can go by you're feeling 'okay' and never realise the potential of awakening to whole new world of possibility vitality and presence. I can't stress this enough, when you're not in your joy, it’s easy for you to forget who you really are and run judgements, shame and guilt from a place of fear through your system. Left unchecked, these feelings will turn into your shadows and will hurt you and others in your life. In fact, it's my opinion that undigested shame, anger and guilt is at the root of many health problems experienced in today's hi-tech, fast paced, disconnected world. When you awaken your Heart Intelligence, you will come to realise that you have three distinct aspects. Like a peach, you will discover that you have an inner core, some sticky goo that surrounds it and a tough skin that keeps all the goo contained and hidden. You will experience what it's like to connect to your core of light and goodness, without shame, guilt or resistance and then anchor your new identity from this place. Surrounding your core, you will then see the false identity you've created out of the fear, loneliness, neglect and trauma of your past. This part of you will feel dark and disconnected - but it's NOT the real you! This part is fear driven and has sponsored many decisions that you've regretted and have felt shameful about. You'll then see how clever your defensive strategies are that have covered all of this and hidden it from others, so that you can function 'normally' without appearing weak and vulnerable. Remember, if you don't learn to 'track' and feel these three distinct aspects of yourself, you will be doomed to act from your default state of separation. Only by daring to feel all of you, will you be free to choose which aspect will become your new home. 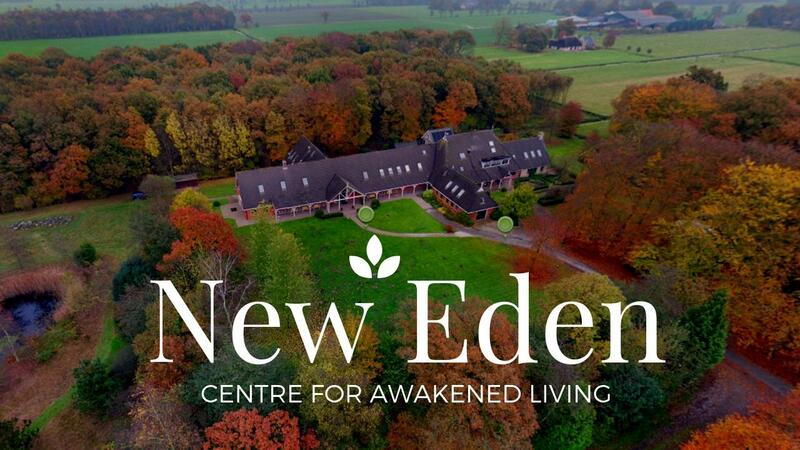 This is the journey we take people on when they decide to visit New Eden, our heaven on earth venue which hosts the Awakened Living Project. To heal effectively we need others to witness us and accept us in our truth, our fear and our defence. I know it sounds scary and perhaps you would prefer to do this alone, but believe me, after working in this arena for over ten years full time, spending over 15,000 hours in small group retreats, the results you can achieve in a group is staggering compared to doing it on your own or one-to-one with a therapist, coach or counsellor. Not only is being witnessed extremely healing, but it’s also incredibly powerful to witness others in their healing process as we can all receive the ‘medicine’ that comes from another’s awakening. Integrating your disconnected parts, and embracing all of what you are is a huge step. However, accepting and loving what is, in the present moment, is only a step in a bigger journey of self empowerment and growth. As a human being, you have a core need to be seen, loved and accepted. But you also have a core need to grow into your potential and know what is possible. It's this part that drives athletes to know 0.1 seconds off their best time, it's what drives us to explore space and expand our knowledge of the universe. It's the inspiration behind Star Trek - one of my favourite shows. So, from a place of deep relaxation and Joy (not fear, stress or 'not enoughness'), you can begin to open up to and expand into new superhuman ranges of potential! The problem is though, that the very ranges you need to reach are intricately connected to your shadows - the very parts you’ve made wrong and don’t want the world to see. Therefore, you're going to have to dig deep and access courage on this journey. I'm sure you'll agree, that many moments of your day are spent in your head, disconnected from your deepest essence, so all your lifeforce and juiciness is either pushed down and repressed or it comes out in funky ways, like addictions, compulsions, habits and fantasies. Wouldn't it be amazing to live your life connected to your fire, presence and radiance? Where you can wake up feeling excited, ready to take on the challenge of living to serve and make a difference? Wouldn't it be amazing to feel so confident and self-assured that there is no part of you that is hidden from the world, because you have turned your shadows into the gifts they were destined to be? This is work we engage in during the Awakened Living Project. Beyond healing and growth, you also have another core need, which if left unmet, will cause immeasurable suffering. Without the nourishment from this part, you will feel empty, flat and unsatisfied. This need is about your experience with the divine, more specifically the experience with your OWN divinity. It's essential that you feel connected to a larger field of intelligence which connects you to all of us and nature together. What's important here, is that you feel yourself, not just connected to it, but actually a part of it. You are a divine being, pure and good in everyway - so this is not about worshiping a deity outside of yourself, but to devote yourself to the practice of claiming your own divine essence and to return home to the place that you've known, deep down, all along where you belong. For years, this realm has been kept from the masses through dogma based organised religion or through individual awakening experiences such as through meditation. But in Heart IQ, we get to awaken our divinity together as a group in a profound collective experience! The amplified field in a group environment like the Awakened Living Project is a tangible way to feel this awakened state and to realise it’s importance - the group, thus, becomes a way to study the intelligence of this field providing a powerful vehicle to practice your awakening. The core ingredient for this process is to develop the quality of stillness. Stillness is not about being static, quiet or contemplative, but it's more about dropping in and feeling the heart beat of life and connecting to a deeper, richer reality of inter-connectedness. You'll drop through the static and high frequency ‘buzz’ and noise of your life and feel your true expanded essence. When you're disconnected from your divinity, you will live in your head, being who you were conditioned to be, and you'll end up thinking you are your personality and that you're limited to what your life has brought you in the past. You'll have needs but you'll get them met strategically, or they will be covered up with competence, perfectionism and over-achievment. But there's another way! Heart IQ is the process by which you can safely and enjoyably open your Heart and connect to your authentic essence, living from that place, surrounded by others who are on this journey with you, in a deeply connected Heart Intelligent community. One of the primary benefits of attending the Awakened Living Project is to elevate your relationship skills by practicing Heart Centered Communication. The result of increasing your intimacy, sense of belonging and your connection with self and others is a huge reward for the courage it takes to open up and be vulnerable. In this environment you'll learn about conflict resolution, how to communicate so who you really lands, how to speak your deepest truth and much more. A deep trust in life is created when you integrate the above practices. You need to Heal your past, Expand your range, Awaken to a higher power while using intimate healthy Relationships as your gymnasium! Trusting life occurs when you have your need for safety met. Safety is not something that others can give you, nor is it something that is created by ‘believing you're safe’. Instead, we need to talk about neurological safety. This type of safety is the result of a nervous system that is free of tension, is relaxed and open to moving energy and emotion through the system freely. This neurological tension and defense has been created by your past hurts, trauma and neglect - some conscious, some unconscious. Sometimes it's pre-natal, sometimes even hereditory, ancestral or even past life sourced. Learning how to use the bound energy in your nervous system productively is key. You must find a way to get embodied, feel safe IN your body, to learn how to feel the tension while discovering how to open your body through breath, energy, sound and movement. The result of being embodied AND awakened to a higher power is what we call Divine Embodiment. It's the perfect balance of being connected as a human, grounded and real while experiencing your sacred divine essence - simultaneously. If you experience embodiment with a disconnect heart, you'll get sucked into the drama of life, and feel co-dependent with everyone else, as you seek to get your needs of safety and trust from others. On the other hand, if you connect to your divinity but don't work on your embodiment, you will likely check out, and use clever new age by-passes to avoid dealing with your pain, hiding in roles of teacher, therapist or healer. The Awakened Living Project offers an integrated way to experience ALL of this and more in a safe, intimate environment, over a weekend or longer (the choice is yours)! Isn't it time you did something for you and made it important to nourish your next step on your journey?